I then moved onto the roof and removed the cover off the base unit where the stepper motor is located. My intention was to start a tune to 40M and watch it extend the metal strip into the tube. I did not need to start a tune as the metal strip was bunched all around the inside of the motor casing. I pulled out three separate pieces and a long strip from inside the tube. It was broken. I removed all the metal strips. I then started a tune and the stepper motor moved which at least indicated that the mechanism was working. Vine communication then sold me a strip of the special tuning strip (35 foot) and I pulled down the antenna to dismantle. I can only say that it took 2 hours as all the sections were tightly locked and the base section had been inserted past the locking collar by mistake which was an enormous job to drift apart again. I finally separated the stepper box from the antenna tubes and took it down to the apartment (some 3 metres of fixed tube). Fitting a new strip sounds easy but in fact the advice is not very clear. For example the metal band is wound onto a large wheel that has a watch spring type mechanism inside that applies reverse pressure when pulled out. 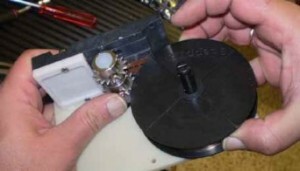 This helps the motor return the strip tightly onto the plastic pulley wheel. Nobody was sure how many anticlockwise turns to apply. Vine was adamant that it was 8 turns, others that it was 4. Obviously the same pulley mechanism is used on the smaller and the HF antennas that use much shorter strips. Hence the confusion. I worked it out that 8 turns was too many and 4 too small so wound the pulley 6 times. I then tested it by feeding out the 10 metres and seeing how much pull was on the pulley. It seemed about right. You don’t want to over tension the spring. This is the pulley with the 10 metres of metal strip wound onto the pre-tensioned pulley being introduced to the stepper motor and contact plate. The whole motor assembly has to be removed to do this as you cannot get past the contact plate without lifting the contacts up. The centre of the pulley has a straight cut across the metal shaft where the pulley spring must be attached, otherwise when the pulley is turned the spring is not wound. Do this wrong and the spring pulls out of the shaft at high tension into the pulley wheel. Nasty.